From photographers James Stark, George Sera, Jim Jocoy, Bobby Castro, Elaine Vestal, and Ruby Ray to never before shown images by ReSearch photographer KameraZie, radical collage work created by Winston Smith and Aleph Omega, powerful sculpture by Winston Tong, and an incredible collection of seminal ‘zines from Punk Globe, Creep, New Deseases, Maximum Rock n” Roll to Search and Destroy; this exhibit is a rare artistic and cultural journey into the formative years of San Francisco punk. Exhibit May 1-9. Opening Reception May 1 6:00-10:00 pm with the dazzling performance art of L’Egregore. 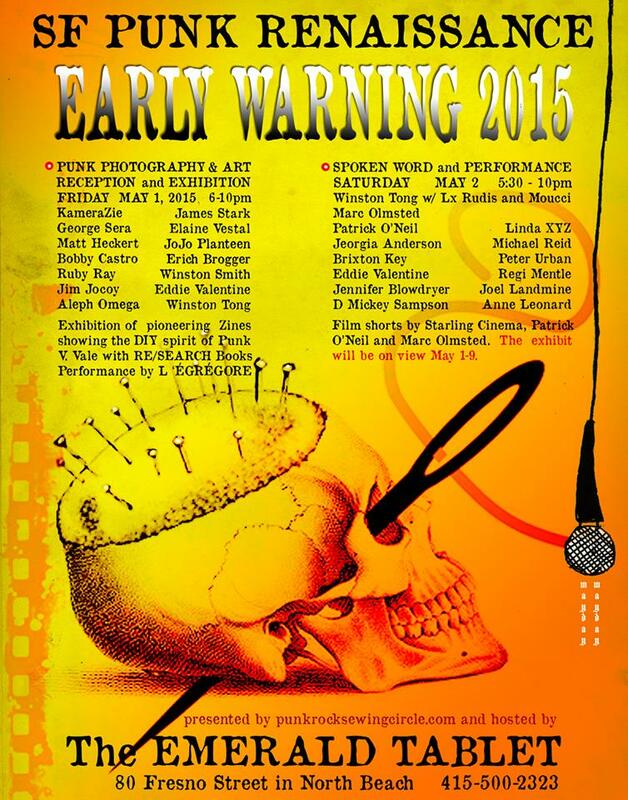 Prepare to be mesmerized on Saturday May 2nd from 5:30-10:00 PM (Door at 5:00) when the Punk Rock Sewing Circle, in collaboration with The Emerald Tablet, Presents SF PUNK RENAISSANCE EARLY WARNING: A SPOKEN WORD EVENT. Don’t miss this evening of powerful punk poetry, prose, and performance art featuring cutting edge poets and authors. Listen to word, wit and wisdom, check out the iconic images and art in the gallery and be visually catapulted into the potent period of rebellion and explosive creativity of San Francisco punk’s first wave. This rare evening, enhanced by the backdrop of iconic pieces from the punk gallery exhibit, is a multi media extravaganza for the senses. V. Vale will have a table for ReSearch and pioneering ‘zine, Search and Destroy. Creative film shorts will punctuate the breaks. Doors open at 5:00 for extra time to view the art, have some appetizers, and share a beverage. Check out the ‘zine exhibit, epitomizing the DIY ethos of the early punk years One of the earliest of punk rock’s DIY manifestations of democratization and empowerment, the fanzine played an integral role in punk rock culture. Sharing local information, providing exposure to bands, and at it’s core catalytic the fanzine placed the reader at the heart of the scene; ‘zines were the voice of the local punk rock community. The rock press, like established rock bands, no longer spoke to the interests of the disenfranchised urban denizens who formed the early punk communities. ‘zines transported the reader to the heart of the action with unbridled access. All it took was typewriter, pen, or crayon, paper, and a xerox machine to become a publisher. Among the pioneering punk ‘zines included in this exhibit are issues of /…Fanzine for a New Generation, Starting Fires, Punk Globe, Maximum Rock ‘n Roll, New Deseases, Creep, Search and Destroy and Damage. V. Vale will will be present with his pioneering ‘zine Search and Destroy and ReSearch.